Litespeed is a great web server which offers drop in replacement of Apache. Litespeed offers a better security and is generally more stable compared to Apache (standalone). Hence, it is why we utilise Litespeed on a number of our servers. 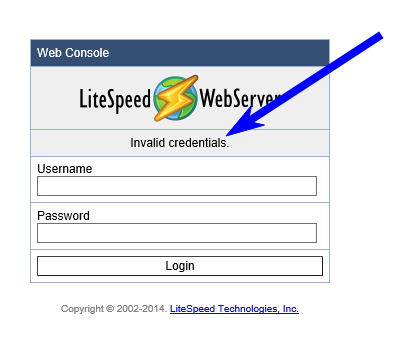 You may have come across this post as you have forgotten your admin login details for the Litespeed admin web interface. As long as you have root (or the ability to elevate to root) SSH access, resetting the password is simple and will take you less than a minute! Step 1 – Login to server via SSH. Ensure you have root access. Step 2 – Navigate to where Litespeed is installed. Step 3 – Change Litespeed password. It will prompt you for the default password for the Litespeed web interface. By default, it is “admin” so you can simply press “enter”. Next, it will ask you to enter the new admin password. Please use a secure password. Step 4 – Test the changes. Try out the new password. Step 5 – Leave a comment below or share. If this helped you, or it does not work, feel free to leave a comment below and don’t forget to share.